Welcome to NCPD LLC, home of the Electric Light Dowsing Rods and the MC Mic and MC EMF multi-colored Electret Condenser and Inductor microphone/speaker. 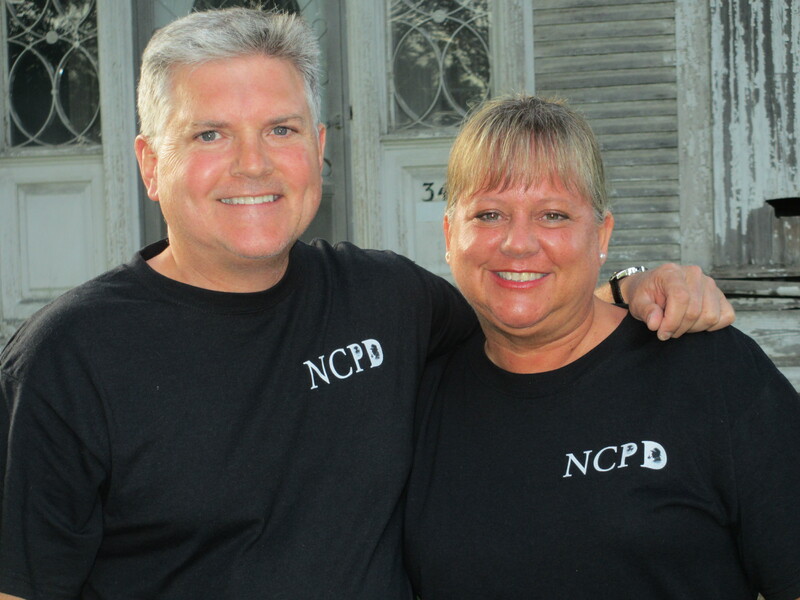 North Canton Paranormal Detectives, or NCPD for short, is a group of like-minded individuals, dedicated to investigating and researching unexplained paranormal phenomena. We use the most current techniques and equipment to obtain evidence of life after death. We assist with public ghost tours and conduct investigations at both historical and private locations. As customary, we never charge for our services. Susie and I demonstrating the EL Dowsing Rods in low light. View of the EL Dowsing Rods with the lights turned off. No flashlights necessary! Available in 5 amazing neon colors: Orange, Yellow, Green, Blue and Pink. The EL Scabbard can be clipped to your belt loop or hung across your back by using the Optional Shoulder Strap which adjusts from 20 inches to 38 inches in length. To learn more how you can purchase your own set of Electric Light Dowsing Rods, please visit Amazon and search for: Electric Light Dowsing Rods. Be sure to configure your purchase by selecting the length 13 or 18 inches, color and with or without the shoulder strap. Thanks to Dave Juliano, we are very happy to announce that the Electric Light Dowsing Rods are now listed at theghosthunterstore.com. His website carries the largest selection of Ghost Hunting Equipment and Supplies, Religious Items and Spiritual Items. This is a short video which introduces the MC Mic (multi-colored Electret Condenser Microphone) and how you would use it to attract the spirits during your paranormal investigations. This 12 min video introduces the MC EMF (Electromagnetic Microphone) and how both the MC Mic and MC EMF can be used in your paranormal investigations. This 20 min video is demonstrates how the MC EMF can be both an EMF microphone and an EMF speaker just depending upon which port you have it plugged into on your recorder. The Advanced Experiments schematic shows how to connect your devices and conduct an EVP session. The question is: Can spirits hear EMF and then in turn respond back in EMF or in a regular EVP? To learn more how you can purchase the MC Mic and MC EMF, please visit Amazon and search for: MC Mic MC EMF. Is there a way to send a photo? I took a photo of my daughter and husband and there is a weird bright light ball that showed up in then photo. I sent you an email. Let me know if you received it. A really great idea!!! We need something new in the field and these help with a dark setting. Kudos! We really appreciate your feedback and support.. We hope people enjoy the EL Dowsing Rods as much as we do.